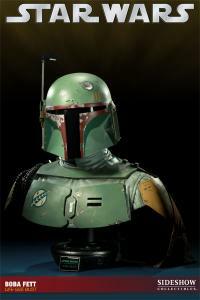 Sideshow Collectibles is proud to celebrate the 30th Anniversary of The Empire Strikes Back with the Boba Fett Life-size Bust. 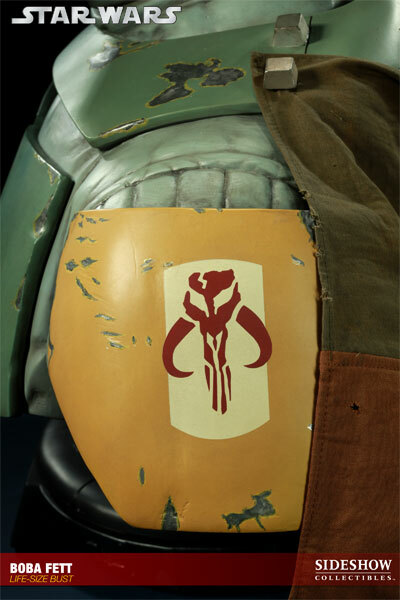 Created in conjunction with Spectral Motion effects house, the Boba Fett Life-size Bust has been meticulously sculpted to capture every detail of the Mandalorian's iconic helmet. Each piece is individually painted and hand-finished, each with its own unique quality and detail that is the trademark of a handcrafted Sideshow Collectibles product. 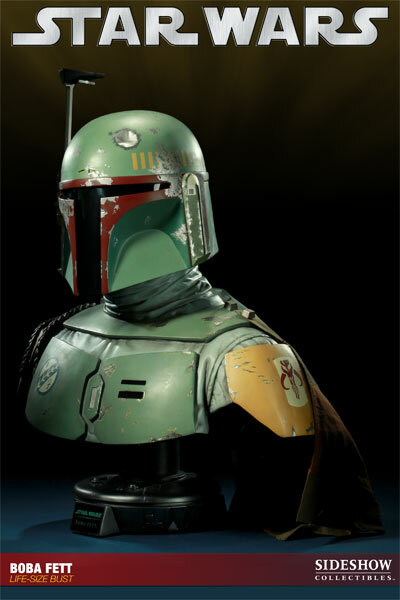 Complete with real fabric cape, the Boba Fett Life-size Bust is sure to become the premier addition to any Star Wars display. This is a seriously jaw-dropping piece of art! Everytime I walk into the room I have to do a double-take because I expect to hear him talk or move his head. This is by far the best piece I've ever gotten from Sideshow. I was on the fence for quite a while on splurging for a life-sized bust. Finally went for it with the Boba Fett bust, and I wish I hadn't waited so long. This is just an amazing piece of work and looks beautiful on my shelf. I've already put in a pre-order for my next bust. I just received my Fett bust and I'm so happy. This item is so much bigger than I anticipated. The attention to detail is spot on. I've had other helmets in the past, but this piece outshines them all. 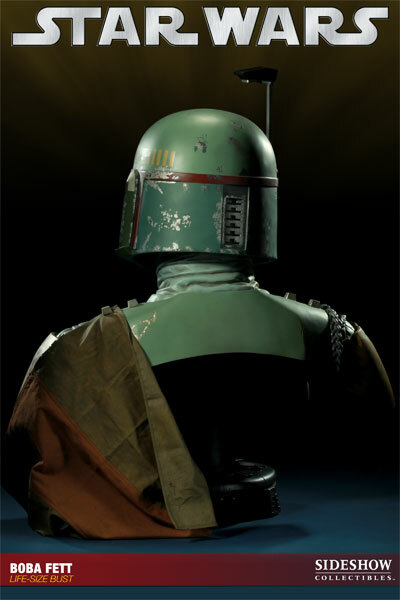 Fett will be right there with you looking over your shoulder. Get it before it's gone! This is my second life size bust and I was still totally unprepared for how massive and imposing this thing is. It easily dwarfs my Cap America life size bust and dominates the room. Once you get over its awe inspiring size then you can appreciate the outstanding attention to detail. A+ Sideshow!!! NOW THATS A BUST !!! Fantastic bust this one - all my friends think it is outstanding as do I. He looks truly menacing, especially next to some stormtrooper helmets. You won't regret it if you buy this. My first life size bust and its stunning.... the sheer size is incredible and the detail paint is awesome....cant wait to get another life size piece for the collection!!! Best boba fett ever!!! 10 months wait worth it! I actually got mine early wednesday December 8th and it even more awesome than the photos suggest! This is my favorite bust of all and I have him right next to my vader, ackbar and grievous life size busts! The detail and paint showing armor battle and rust is the best! Cape is awesome too! "Lifesize" means squat until you have this baby in front of you. Simply spectacular!! So glad I got him! If you can budget it, by all means get him! Great work sideshow!!! Wow, Sideshow really came through. Gone is the pinched helmet from the pre-production photos. In its place, a very impressive likeness of Fett. More stunning in person than even the production photos would suggest. 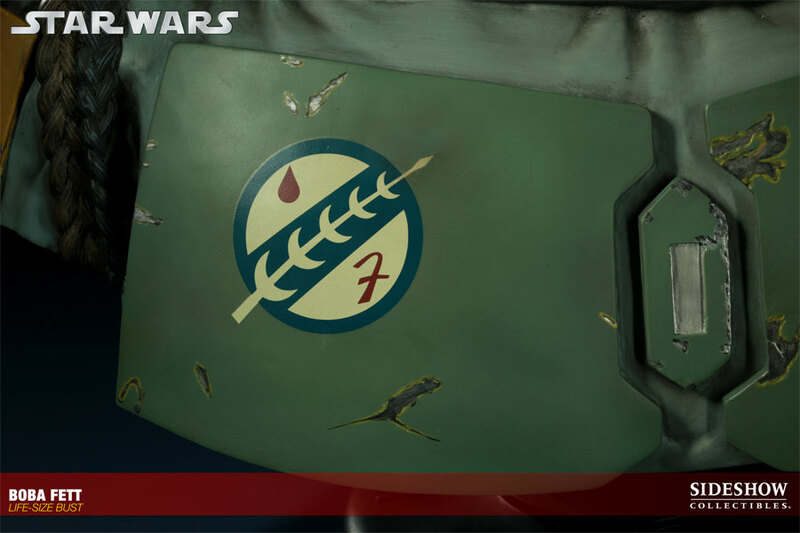 Fett has to be one of the hardest characters to nail, but SS did it. Well done!